Quantum computing is now within closer reach thanks to a major breakthrough in which scientists have demonstrated that a key building block can be assembled. Quantum computers are based on atomic-scale quantum bits, or qubits, that can represent both 0 and 1 simultaneously, and they are expected to deliver huge performance gains over traditional computers. Realizing that potential, however, depends on the ability to build working quantum circuits. That's where the Fredkin gate, also known as a controlled-SWAP gate, comes in. The quantum version of the classic Fredkin gate exchanges two qubits depending on the value of the third. It could be a key component of quantum circuitry, but because of the complexity involved, no one has ever managed to build one in the real world -- until now. 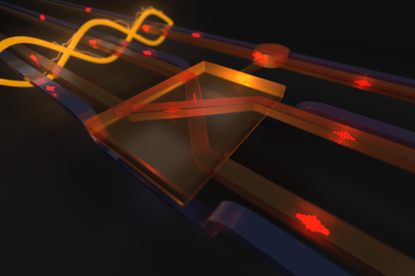 Whereas the Fredkin gate typically requires a circuit of five logic operations, researchers from Griffith University and the University of Queensland used the quantum entanglement of particles of light to implement the controlled-SWAP operation directly. Essentially, the scientists demonstrated how to build large quantum circuits directly, without having to use numerous small logic gates. That, in turn, puts real quantum computers within closer reach. Scientists at Florida State University’s National High Magnetic Field Laboratory (MagLab) recently reported a breakthrough with similar promise by minimizing qubits' susceptibility to magnetic disturbances. The new research was published last week in Science Advances.